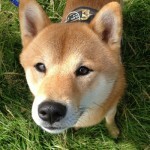 I was recommended Laura and Penel at Dog Communication by a friend who has used them for her dog. I loved the idea that they used their own dogs to help with socialising new dogs! Right from the get go they were extremely helpful and understanding. During the initial one to one assessment they were friendly, professional and seemed to understand my dogs issues immediately. They put me at ease where I had previously being stressing about my dogs behavioural problems. The feed back I got from the assessment was thorough, in depth and mind opening into how my dog feels and therefore was behaving. I couldn’t wait to pass on the new information I’d learnt! The following group sessions were great for my dog and she just loved them. The way that my dog would just sprint towards Penel and Laura as soon as she saw them put my mind at rest to how much she was enjoying her socialising play dates! I cant recommend Laura and Penel enough! Owning a dog with an aggression problem is a nightmare. Having had advise from various “dog experts” for advise to cure the problem with my border terrier and all to no avail I was at my wits end. One day when trolling the internet I came across a link to “Dog Communication” from another website. When I saw that it was in Banstead and I live in Suffolk, it made me think long and hard before I contacted them. 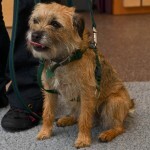 I phoned Laura, we had a long chat and she thought they could do something to change my 5 year old border terrier which is aggressive towards other dogs to a normal border which is a pleasure to take for a walk. Laura, Penel, Toffee myself and various teaching dogs live and stuffed had a 1 2 1 session, they thought it would be fine if I joined a class. I went to several classes which both Toffee and I learnt a fair bit. But I found the drive down every week too much more so because the winter was approaching. I was sorry to stop going to the class, but Penel found someone in Suffolk who could possible help, and they are carrying on the good work started by Dog Communication. In April I attended a seminar run by Dog Communication on understanding canine communication, this I found very helpful and now can read the signs not only for my dog but any approaching dog. Six months down the line I now have a border terrier who does not spend the time on a walk looking for another dog to have a go at, she is not perfect yet but I hope in time will get there. I first met Laura, Penel and their teaching dogs in 2011. 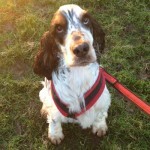 I had adopted Merlin, a 5 year old extremely reactive dog and I was ‘in over my head’ . Through 1-1 sessions, Penel and Laura helped both Merlin and I to communicate with each other and provided me with advice and strategies to help both of us manage his many fears. They helped me understand that due to Merlin’s mix of genetics and bad experiences, he was never going to be ‘normal’ but thanks to them he had a greatly improved quality life until he died in 2014. My current dog, Georgia (collie x Labrador) is 8 months old and has been attending the Lifeskills classes since she was 13 weeks. I am absolutely delighted with her progress – she has already learnt so much from the teaching dogs Beama, Luka and Elsa and is developing into a confident dog with good skills in canine communication. The class provides a good balance of off lead and on lead exercises and interactions and all the dogs (and owners) seem to have lots of fun as well learning opportunities. I brought Daisy (Staffordshire Bull Terrier) to Laura and Penel for assessment in August 2013 as she had become reactive to other dogs after having been attacked. Walks had become a nightmare with both Daisy and I tense and on the look out for any strange dog appearing on the horizon. 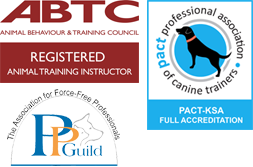 From the start I was very impressed with Dog Comm’s professional set-up – detailed questionnaire and report and very safe fenced training environment and procedures. I was also reassured by Laura and Penel’s friendly and calm “we can sort this” approach. Daisy and I started out in Training and Control class, with my husband Chris joining us, working on various kind and reward-based methods to help us deal with meeting other dogs in a calmer manner. Soon we found we were not the only people with a reactive dog – I found it very helpful to meet and train alongside other people who were working to overcome the same issues. When I first took Daisy to Dog Comm my husband wasn’t entirely convinced that Daisy needed expert help, but he was soon won over when he saw the positive results of applying calm consistent training. Change didn’t happen overnight, but gradually, sometimes with steps backwards as well as forwards, but supported all the way by Laura and Penel and the other dog owners. Over time Daisy became less reactive when she saw another dog and more inclined to look to us for guidance and treats, or obey our command to turn round and move away, rather than lunging and snarling. The biggest breakthrough came during onlead group walks. 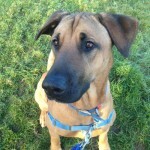 Daisy was able to walk quietly behind, in front of, and eventually alongside other dogs. One day she even plucked up enough courage to tentatively sniff the rear of Laura’s dog Elsa. Elsa responded in a happy manner and the two became friends, the first friend Daisy had made in several years. 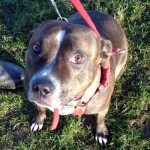 Since then Daisy has made friends with several other dogs at the classes. We now have a dog that can manage seeing non-reactive dogs at a distance, can participate in onlead group walks without difficulty, can calm herself much quicker if she does initially panic a little at seeing another dog, and can be walked past dogs who are reacting negatively by using distraction methods and treats. We also know that given the right amount of time and distance Daisy can not only tolerate other dogs but make new friends too. I think Daisy is a happier dog for all of this, life is a bit more predictable and a little less frightening now her humans understand she is nervous of certain things and react in a consistent way to those scary things. One useful by-product of training at Hengest Farm is that Daisy is now much more relaxed around sheep and horses as well as dogs. I would also add that I have learned a great deal about dog behaviour from Laura and Penel and in particular from their excellent seminar. Dog Comm keeps up-to-date with all the current science on dogs and encourages their clients to read different articles and expand their knowledge. Finally I would add that the only reason we no longer go to Dog Comm is that we moved about 180 miles away to be closer to family. 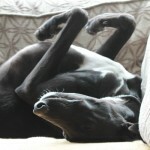 When I first got Tiffany (greyhound) she was quite lead-reactive to other dogs. I guess as an ex-racing greyhound she had just never been socialised properly and was nervous of meeting other dogs – even other greyhounds. Not helped by the fact that she had to be walked on a lead for quite a while… In that first year we spent most of our walks trying to avoid other dogs. And meeting other dogs, particularly when they were off lead was always quite stressful! Unfortunately I also wasn’t successful with finding a socialisation group or class for her – everything seemed to be geared at puppies. As we’re living in Brighton, going up to Dog Communications wasn’t the easiest option – I had to learn to drive and get a car first (I often joke that Tiffany has to be the most spoiled dog ever as she has her own chauffeur!). Anyway, it was the best thing we could have done. It gave her the chance to meet other dogs in a safe environment and both Tiffany and I have learned so much. She is so much better now around other dogs – and I have learned how to read and understand her body language better and help her around other dogs. And we’re both more relaxed, which always helps! She has now found a few firm friends and is much better at meeting new dogs when we’re out & about. She still sometimes growls at other dogs, but I’ve realised that that can be O.K. and an appropriate reaction when other dogs are rude and ‘in her face’. On the other hand she is now sometimes seeking contact and the other day she even initiated play with a young retriever – I was so proud of her! We’ve seen big reduction in Jed’s (terrier) on lead reactivity since attending classes at Dog Communication and making some simple recommended changes to his routine. Working with Jed in a group environment has allowed us to understand him better and help him him cope with situations he finds challenging out on our daily walks. We particularly like that Laura and Penel use methods that are kind and based in a scientific understanding of how dogs behave. We would not hesitate to recommend them and only wish we’d started sooner! We found our way to Dog Communication to resolve some specific problems with our young greyhound Quinn. Quinn was bought by a family ‘off the internet’ for the amusement of a bored child at 6 weeks old. They utterly failed to understand the needs of a dog and locked him into a cage when at work/school etc. By three months he was in rescue. 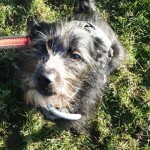 We rescue him but found he still had issues – particularly with socialisation and communication with other dogs. This is where you need expert! You can’t make it up yourselves because so many of our intuitions are wrong (or at least human intuitions and not dog intuitions). Thankfully Penel and Laura are experts but they are wonderful, friendly, supportive and encouraging experts. 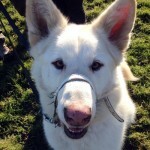 They helped us to understand Quinn better and to develop strategies for dealing with some of the issues… but also the controlled interaction with other dogs at classes (under their watchful and penetrating eyes) helped to teach him some of the communication skills he lacked so badly to start with. Working with them has changed the way we view dogs and owners and the interactions between the two. It has enriched our relationship with both our dogs and made us both more confident owners.Thank you both. My husband and I rehomed a 9 month old German Shepherd ,Great Dane cross from Battersea about 2 years ago. He was shy around people but very full on and excitable around dogs. We became very concerned that he may be a problem around dogs after a few encounters he had when he rushed up to dogs and it didn’t go well. I found dog communication on the internet after deciding that standard dog training was not what he needed. We wanted him to be good around people and dogs and come back when we wanted – this turned out to be the dog communication mantra! 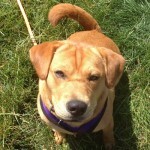 We had the initial assessment and were relieved that he wasn’t aggressive at all but just had no doggie manners. Over the last 2 years we have been to off lead naughty but nice classes, on lead group walks , day seminars and most recently on lead Training and Control classes. Apart from the obvious training Archie has had the one thing that has really helped is that talking to Laura and Penel and other owners makes you feel ‘normal’ and encouraged not to give up and has given me so much more confidence to deal with Archie. You don’t feel that you have to cope alone and there are techniques that will work. Archie is much better on the lead, his recall is good and although he still has a way to go with his manners, he can now have good encounters with other dogs if managed properly. I highly recommend Dog Communication to anyone wants calm and relaxed classes, advice and support with their dog – thank you Laura and Penel! Toby (yorkie x poodle) is my first dog and with Penel and Laura’s expertise I have gained a lot of knowledge about dogs and how they communicate. 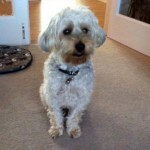 Toby was chased when he was young and became very nervous around other dogs. He also has a problem with resource guarding and I felt I would never be able to ever let him off the lead. 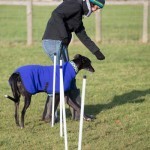 When I was introduced to Penel and Laura and their teaching dogs, they assessed Toby and we began the Shy Guys class. Since then, Toby’s confidence has grown and grown, he has learnt excellent recall and now enjoys walks off the lead and is not as nervous around other dogs. Penel and Laura have also helped me understand the resource guarding behaviour and attending the their classes have not only been good for Toby but I have also gained from them as well. Penel and Laura have so much knowledge and are always willing to talk through any problems I might have. Thank you both for helping us. I have been taking Brodie to the Lifeskills class since he was five months old and he is now two and a half and we still attend regularly. Brodie was initially quite shy around people he didn’t know, but this has improved enormously and I believe that attending this class is a result of this. 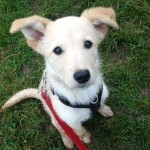 Brodie really enjoys the company of other dogs and cannot wait to get in the field to play with his friends. We have found this class particularly helpful as it focusses on preventing issues before they arise. We are hoping to add a new dog to our family this summer and will definitely be bringing her to Penel and Laura to give her the same positive start that Brodie has had. When we first met Laura and Penel, we were the proud owners of a 56kg Alaskan Malamute who at 2 years old changed from our super tolerant playful boy to displaying quite challenging behaviours both on and off lead following a few incidents with other male dogs. We tried several different trainers all assuring us that they could teach us how to control Hercules but he just seemed to get worse and less tolerant. We couldn’t walk him on lead anywhere near another dog without him lunging and barking and spent months walking him in the dark to try and avoid other people walking their dogs. Then one day we turned up at the “magic” field for our assessment and we haven’t looked back. Laura and Penel are very supportive and make each dog and owner feel special, they take the time to listen to your frustrations and from personal experience are able to provide guidance on how to tackle different situations so it is a positive experience for us both. We take advantage of as many of the group training sessions, group walks and workshops as we can. We have learnt to understand him better, how to read his body language in different situations and how to reward him correctly. We don’t hide in the dark anymore! A year ago Max, our 6 year old Weimaraner rescue was a Jekyll & Hyde character; at home a loving dog who had seamlessly moved into our lives; which included our 3 cats but outside the home a nervous, anxious dog who displayed almost uncontrollable fear aggression in the vicinity of other dogs. Fortunately, after unsuccessful sessions with several local dog trainers, we discovered Laura and Penel of Dog Communication. Their patience and guidance working with small groups of dogs and their owners has over the last year transformed Max and made dog walking the enjoyable pastime it should be. 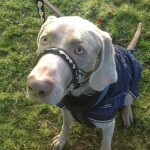 Max now takes part in group walks with our local dog owner friends; very happy in a mixed pack. He is able to meet and greet new dogs particularly female and neutered males with nonchalance. Entire males can still be an issue but even these potentially difficult situations are easily controllable based on the guidance Jackie and I have received. What else can we say, heartfelt thanks from all. We took our Obi Wan to dog comm because he was becoming reactive to other dogs, he was insecure and afraid but to the outside world it looked like aggression. Laura and Penel, assessed obi wan and were able to offer alternative ways for Obi Wan to cope around other dogs, it was all done with kindness and obi wan was never forced into anything to make him react I also learned so much from their huge knowledge of dog behaviour. Obi wan now has several doggy friends, he has gained weight and is no longer stressed out. We have been taking Alfie to Dog comms for about a year and a half now. We first took him on recommendation of a local behaviourist following a couple of worrying behaviour displays about 6 weeks after we rescued him. I can honestly say it is the best thing we could have done. Laura and Penel are kind, patient and have helped us enormously in classes, 121s, and understanding why he reacts the way he does. They have even been on the end of the phone after he did something that nearly had him sent back to the rescue home… All our family and friends say that he is like a different dog now. We still take him to classes because there are always new dogs, people and training to learn so it’s great practice for him and us, and it’s good to meet other dog owners who have similar predicaments! Thanks for helping us to stick with Alfie and making it fun along the way.